A millennial history that lives below the ground in Naples, a journey to discover the close bond of faith between the city and its patron saint, San Gennaro. 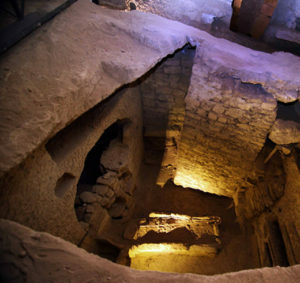 The Catacombs of San Gennaro are arrange on two levels that are not superimposed, both characterised by much larger spaces than the more famous Roman catacombs. This is due to the workability and strength of the tuff. The original nucleus of the Catacombs of San Gennaro dates back to the 2nd century AD. It was probably the tomb of a noble family, who then provided spaces for the Christian community. 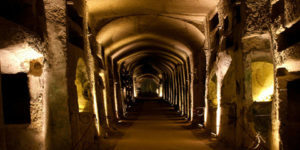 The expansion began in the 4th century AD following the deposition of the remains of St. Agrippinus, the first patron of Naples, to the underground basilica dedicated to him. 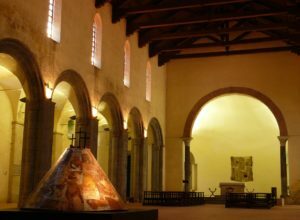 It consists of a single nave dug out of the tuff, which still preserves a bishop’s chair carved into the rock and the altar with an opening, in which the faithful could see and touch the saint’s tomb. The lower catacomb extends around the Basilica of Sant’Agrippino, following a reticulated structure. The vast spaces and the regularity of its shapes silently welcome visitors into a timeless place. The imposing lower vestibule, with ceilings measuring up to 6 metres high, houses a large baptismal font commissioned by Bishop Paul II, who took refuge in the Catacombs of San Gennaro in the eighth century during iconoclastic struggles. 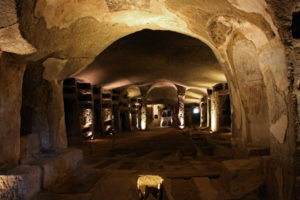 The upper catacomb originates from an ancient tomb, dating from the third century AD, which preserves some of the earliest Christian paintings in southern Italy. 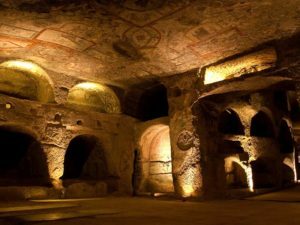 Two examples of the expansion of the Catacomb are the Crypt of the Bishops, where the city’s bishops are buried, and the majestic basilica adjecta, an underground basilica with three naves, built after the transfer of San Gennaro’s remains.